Ever been bullied for being a geek? The reason it resonated with me is that I too was not one of the cool kids at school. I was shy and very quiet, and much preferred reading and watching cartoons and films to joining the local or school sports teams. I did try hard at sport, but always seemed to fail dismally. I was also short and skinny. I was bullied as well, as I didn't fit in with the cool kids, and I hated much of my time at secondary school, but tended to keep that to myself and didn't talk about it. At my school it wasn't the done thing to complain about being bullied. Needless to say I have never been back since the day I sat my last A-Level. 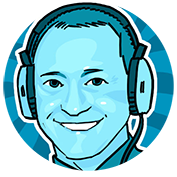 Tony's blog post was inspired by a song by actress Felicia Day and The Guild. The song is called 'I'm The One That's Cool' and I downloaded it from itunes as soon as I heard it (see YouTube video at the end of this post). Geek culture, the kind of thing that Tony and I were picked on for liking, is now the new cool. The Avengers has become one of the best selling films of all time and millions of people tune in to watch each new season of Doctor Who. 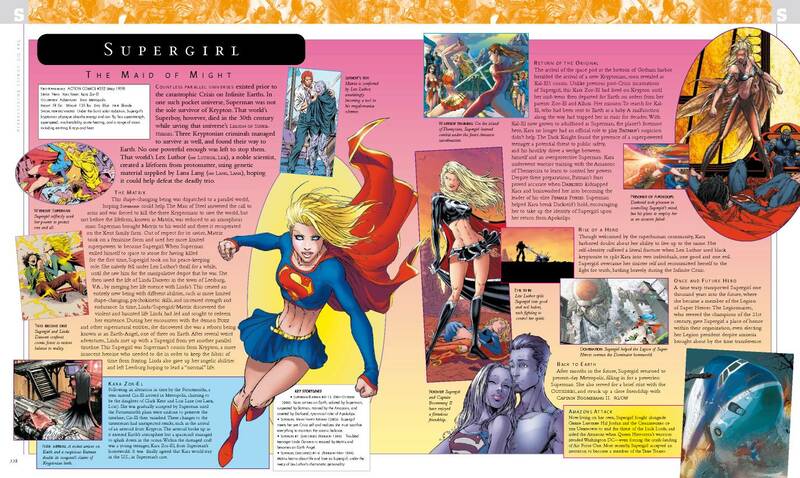 I do have one or two small regrets as far as being a geek is concerned: I had very little access to Marvel/DC comics and I never played D&D has a teen (I didn't know anyone who would play it with me), and all these years later I have still never played a RPG (and feel I have missed out, especially when I hear blogger friends and authors talking so animatedly about it). Like Tony, my experiences as a teen have made me the person I am today. I hate bullying with a passion, and as a Head of Year for seven years at school I worked tirelessly to deal with any case that came my way. I also never judge a student for what they choose to wear, the music they like or the hobbies they have. I love geeking out with the boys, and have converted several to reading comics (several of my sixth formers now have standing orders with Forbidden Planet). And of course, I am doing everything I can at school to make reading cool. As well as showcasing Tony Lee's blog post I want to add a little something to the quiet, shy kids out there. When I was a teenager the thought of any kind of public speaking filled me with abject terror, and I never dreamed I would one day be a teacher. These days I regularly present in assemblies of 240+ kids, or large groups of parents and staff, and do so with ease. I also DJ, and even though I am nervous before every event I do, once I am started I love it. I would say to any child like this not to worry about being shy, you can overcome it, but sometimes it takes a little time - I had been teaching for six years before I found the guts to lead an assembly! Tony Lee is the writer of a multitude of comics and graphic novels, the most recent being a Doctor Who/Star trek crossover. Personally, I can't wait to get my hands on a copy of his MacGyver comic when it eventually hits the stores. Tired of vampires? All zombied out? Not a fan of gore? If you love horror and can say yes to any or all of these then The Hunting Ground by Cliff McNish might be for you. With the success in cinemas of The Woman in Black is would appear that the more traditional ghost stories are gaining in popularity again. Already this year I have reviewed Michelle Harrison's Unrest and James Dawson's Hollow Pike, both of which rely heavily on the creep factor rather than blood splatter, and The Hunting Ground is another book in this vein. 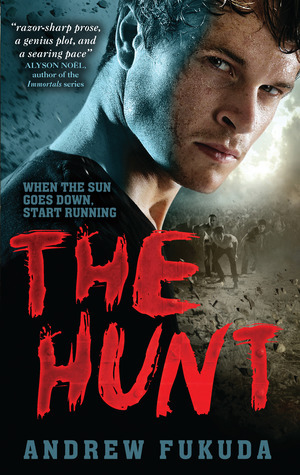 The Hunting Ground was first released in 2011 by Orion's Children's Books, but was re-released earlier in 2012 as part of Orion's new YA imprint, Indigo. It certainly sits better in my mind as a book for teens as it is the kind of book from which nightmares are born. 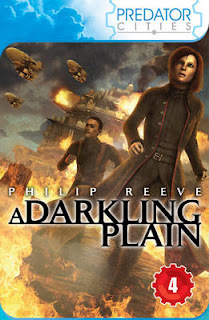 I'm trying to think of a way to describe the plot without giving too much away, as much of the impact from this book comes from the tension that Cliff McNish skilfully builds as the story progresses, with the reader constantly guessing (and fearing) what might happen next. Too put it as concisely as possible, two boys and their father move into a run-down country mansion that is in dire need of renovation. Naturally, this being a ghost story, the house has quite a nasty history. A previous owner, Cullayn, was a vicious beast of a man, and unfortunately for boys the despicable atrocities he committed have left a mark on the house that could have dire consequences for them many years on. The pace of the story was absolutely spot on in my opinion. 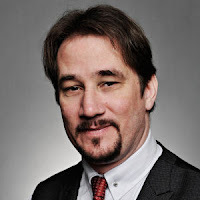 Cliff McNish has pulses racing with his more terrifying scenes, but knows exactly when to pull back and give the reader a little respite, before ratcheting the fear actor up all over gain. In doing so the tension in the story builds constantly throughout the book, so that when we come to the climactic closing scenes we are little more than gibbering wrecks, jumping at the smallest noise. Cliff McNish has again proved that he is a master of dark storytelling, and I am a little saddened that he is not as widely known as the other current masters of teen horror. Much as I enjoyed Hollow Pike by James Dawson I found The Hunting Ground to be a much scarier read and I have been pushing it with the horror fans at school ever since. McNish is able to tap into a reader's psyche and seem to take great delight in playing around with their primal fears. I am not easily scared but having read this well into the night I did then experience uncomfortable dreams where I was being chased through long, empty corridors by an unknown entity. 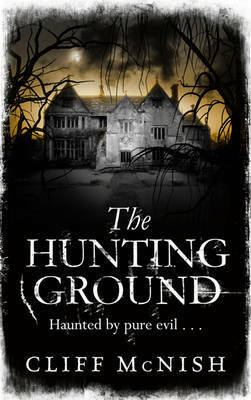 For confident older teen readers The Hunting Ground could make the perfect entry into some of the classic ghost/horror stories by the likes of Edgar Allen Poe and M.R. James or the brilliant The Haunting of Hill House by Shirley Jackson. My thanks go to the lovely people at Orion for sending me a copy to review. Last week I posted images of the redesigned covers for what has been known as the Mortal Engines series by Philip Reeve, but from now on will be known as the Predator Cities Quartet. 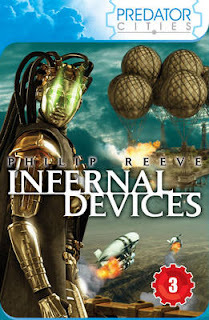 As I have just as many readers in the US these days I thought it only fair to showcase the redesigned covers for the US versions, as I have just spotted them on Philip's own blog. I know which ones I personally prefer - in my opinion these US covers are the perfect graphical embodiment of the pictures I have in my mind when I read these stories. David Gatward is a member of my 'drop everything' list, by which I mean that when a new book comes through from an author on that list I literally drop everything to read it. Even if I'm mid-way through another book. It isn't a particularly long list, although it grows year by year, but I still don't know what I would do if two books arrived at the same time. Let's hope that never happens. I loved David's The Dead trilogy, and rank them as some of the best children's horror books ever written. Sadly though the adventures of Lazarus Stone came to an end, but I have been on tenterhooks waiting to see what Mr Gatward wrote next, and I have therefore been looking forward to this one for some time. Back in February I posted a guest piece by David about Doom Rider, as part of my Coming Up In 2012 feature, and I have been eagerly awaiting its arrival ever since. Thanks to the lovely people at Hodder I was able to dive in to the proof about ten days ago, and read it in a single sitting. David Gatward is still yet to disappoint me. Doom Rider is a finely crafted apocalyptic horror story that proves he is no one-trick pony, and goes a long way to establishing him as having one of the darkest imaginations in teen fiction. Many of the reviews of The Dead trilogy, including my own, played heavily on the gore that dripped bloodily from the pages. However, there was a lot more to those books than just the blood splatter - great characters, descriptive writing to die for, cracking dialogue with many great humorous moments, tight plotting and an exciting pace that will have you reaching for the defibrillator as your heart struggles to keep up. But still, most review focused on the gore. In Doom Rider David Gatward gives the gore little more than a cameo role, but has still produced a great horror story that will have critics and teen readers begging for more. Doom Rider is set in Britain, at some undefined point in the not-too-distant future. Religious extremism grips the population in a way that is similar to some middle-eastern countries at the moment. The religion of choice is referred to as The Way, the leader of their 'church' known only as The Protector. Seth Crow lives in a caravan with his sister and his parents, travelling from festival to festival, pulling in the crowds with their show that preys on the public's fears about the end of the world, and more specifically about how and when they will die. Christened The Apocalypse Boy, Seth is a key part of this show, as he has a talent for 'cold reading' people - just like TV's The Mentalist, in a matter of seconds he can read a person, and make eerily accurate statements about their lives. As such, when he moves on to telling them about their death's the crowds simply lap it up. However, Seth is fed up with this life of duplicity, and the moods of his authoritarian father, and so he plans to escape. However, before he can he meets Lily, and from that moment his life changes is ways he could never have predicted. Lily is a seeker, tasked with tracking down young people before they reach the age of 13, at which point The Protector and his elite inner circle of enforcers, The Chosen, believe that they will morph into one of the prophesied four horsemen of the apocalypse. We quickly find out that Seth has had many, many previous lives, and in every one he has been violently killed before he can reach his teens. Lily has had enough of this, and instead of leading The Chosen to Seth she helps him to escape. Of course, as the clock ticks over onto the day of his 13th birthday all hell begins to break loose, for Seth is Conquest, the first horseman of the apocalypse. At this point the pace of the story ratchets up to a whole new level, as Seth and Lily try to track down the three remaining riders, whilst trying to avoid being killed by The Chosen. Their efforts are more than a little hampered by Seth's new-found desire to destroy anything and everything in his new role. That's pretty much all you are going to get from me plot-wise as Doom Rider a book that will best be enjoyed with as little prior knowledge as possible. I grew up in the church, and my mother is an ordained minister, and so there were parts of The Dead trilogy that resonated with some of the great biblical imagery that I was opened up to as a child and a teenager. I was pleasantly surprised then, when I read the press release for Doom Rider, to discover that David Gatward had a very similar upbringing. His knowledge of biblical imagery and the events that take place in The Book of Revelation, is obvious in Doom Rider, and by putting his own twist on things he has created a dark, modern horror story that is a long way from the New Testament version of 'the end'. I was also pleased to see him veer away from the norm, by having his horsemen named Conquest, Strife, Famine and Death, which is more in line with the concepts I had when growing up. However, as David brings attention to this himself in his Author Note at the end of the book I can't help but feel something of a fraud by mentioning my this in my review. much as it entertains and forces us to ask questions. Then there's the other side of it, too. I love a good, scary story! I love creating horrifying monsters and putting my characters in situations they simply can't survive, but do. It's a part of that sense of being a kid again, and creeping downstairs in the middle of the night so as not to wake the parents to watch a horror movie on TV because you really don't want them to know you've just seen a head explode in full-blown technicolour, and some terrifying demon launch itself at the next hapless victim, claws dripping in blood... And you know what? I'm happy with that." 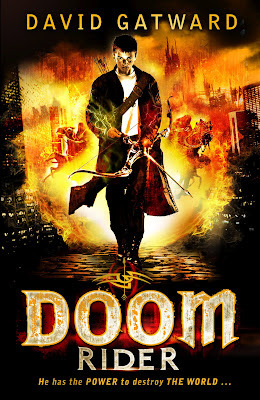 Doom Rider is a standalone story and the book is scheduled to be released in paperback on 5th July. My thanks go to the generous people at Hodder for sending me a copy to review. I spotted this on Derek's blog yesterday and thought you would all like to see it. If you have been visiting The Book Zone for a while you will know that I am a huge fan of the Skulduggery Pleasant books, and I love every one of the covers that illustrator Tom Percival has produced for them, and the hardcover spines look great lined up on my bookshelf. 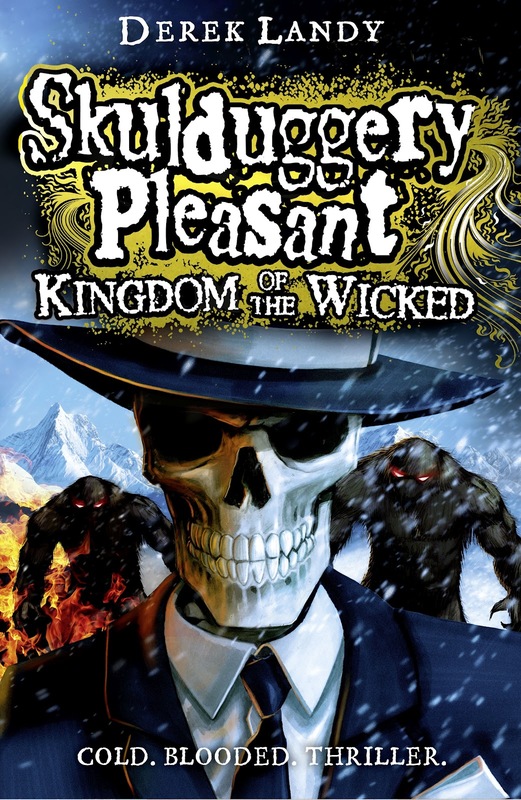 The cover for Kingdom of the Wicked, the seventh novel in the series, is no exception - what a great close up of SP's face! The book is not due to be published until 30th August, but I'm already excited by the blurb. Fingers crossed Tanith will make an appearance after her absence from Death Bringer. Make sure to click on the image to see it in all of its super-sized glory! Attention Grabber is my almost-weekly feature where I post what I think is a great opening paragraph to a book, the sort of opening that pulls young readers in and hooks them from the start. 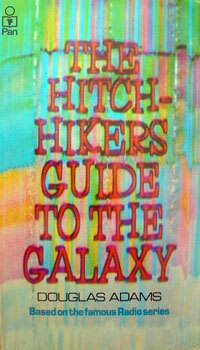 Towel Day (for fans of the late, great Douglas Adams). I felt it only appropriate that I should celebrate one of these on The Book Zone, and decided that showcasing the opening paragraphs of The Hitchhiker's Guide To The Galaxy in my Attention Grabber feature would be the perfect way to do this. This book had a huge effect on me as a young reader, and it is still one of my favourite reads as an adult. This planet has - or rather had - a problem, which was this: most of the people on it were unhappy for pretty much of the time. Many solutions were suggested for this problem, but most of these were largely concerned with the movements of small green pieces of paper, which is odd because on the whole it wasn't the small green pieces of paper that were unhappy. It is also the story of a book, a book called The Hitchhiker's Guide to the Galaxy - not an Earth book, never published on Earth, and until the terrible catastrophe occurred, never seen or heard of by any Earthman. I've just had a flesh-eating giant tearing around my house and now I'm in this strange land I don't know anything about'! Before she can untangle the mystery that will save Bellania, Charlie Keeper needs the answer to a life-changing secret her guardian, the dastardly Mr Crow, has been keeping from her ...Just who is Charlie Keeper? I first came across this book some years ago when it was self-published by author Marcus Alexander under the title Who Is Charlie Keeper?. At the time it struck me as being a hugely enjoyable fantasy story for kids, but like many self-published books I felt it needed to go through the hands of a good editor. A few years on and it has been picked up by Puffin and given the editing the story so richly deserved, and what we have now is a well-polished hugely enjoyable fantasy story for kids. The story follows the adventures of Charlie Keeper, a thirteen-year-old girl who is as good as being an orphan as her parents disappeared mysteriously some years ago. Her life is made all the more miserable by her legal guardian, Mr Crow, who, in line with the terms in her parents' will, has full control over Charlie, the house she lives in and the funds her parents left behind. Charlie detests Crow, and suspects him of a variety of nefarious activities, such as selling off the family antiques. What she does not realise is that nefarious doesn't even come close to describing Crow's true intentions, and there is a lot more to him than meets the eye. We very quickly discover that the house in which they live is a little different from your average family home. From the outside is looks almost like any other house, albeit slightly peculiar as it is a big, old thing surrounded by much smaller, more modern houses. To most, it probably doesn't look particularly special on the inside either, but Charlie has always felt that it is a little bit different from other houses. We begin to discover some of these oddities very early on in the book, but only as a lead in to what happens next. Charlie discovers that Crow is in league with an other-worldly being, and whilst attempting to escape from his Shades, Charlie flees through a door and finds herself having to leap into darkness, and lands in another world completely. Bellania, naturally, is a magical land, full of the strange and the fantastic, but it is a land with problems, and it might be down to Charlie to save it. There are a handful of elements of the plot that we have seen before in other fantasy stories post-Harry Potter, but this isn't a bad thing as Marcus Alexander manages to put enough of his own into them to make them seem nearly-new. The nature of the magic in Bellania felt particularly fresh, and will appeal to the imaginations of young readers. For me though, the most enjoyable part of the book was its villains. Every fantasy story needs a great villain (think The White Witch in the Narnia stories or Voldemort in HP), and in Mr Crow and Lord Bane, Marcus Alexander has created a pair of bad guys that readers will love to hate. Before I sign off I feel I should also mention the illustrations. Spaced throughout the book are some beautiful black and white manga-style images of a number of the creatures that Charlie encounters during the course of her adventures. These make a great visual addition to the story, although I would love to have seen many more of them. 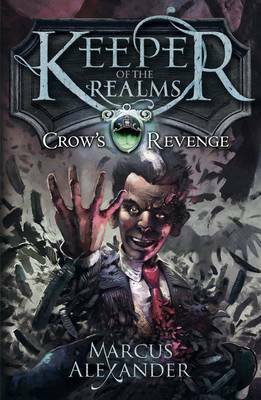 Keeper of the Realms: Crow's Revenge was published by Puffin back in February,and my thanks go to them for sending me a copy to review. The sequel is scheduled to be published in February 2012. I've never minded that my name's Barry Loser because my coolness has always cancelled it out, but ever since Darren Darrenofski joined school with his horrible little crocodile face he's been completely ruining my life about it. "I Am Not A Loser" is the first of three notebooks belonging to Barry Loser. Follow Barry as he tries throw off his loserness, take revenge on the terrible Fronkle-burping Darren Darrenofski and finally become a winner. Any phenomenonly successful series naturally leads to a host of imitators. Harry Potter led to a plethora of titles set in magical worlds with witches and wizards. Horowitz's Alex Rider series opened the floodgates to a tide of teen agents. In the last few years we have now seen the same happen as a result of the popularity of Jeff Kinney's Diary of a Wimpy Kid. I'm not criticising this at all - if a formula is found to be successful at getting kids to read then shared use of it can only be a good thing as long as quality is maintained. 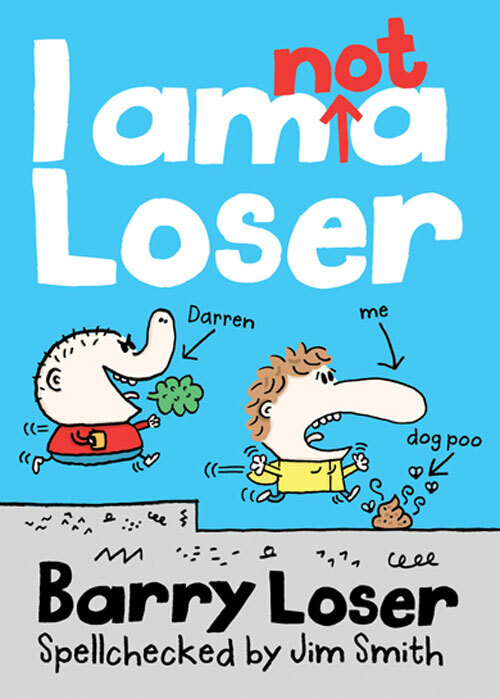 Barry Loser: I Am Not A Loser is the latest of these Wimpy Kid-style books to hit the market. It is told in the words of the eponymous Barry Loser, a kid who despite his terrible surname has never suffered any problems at school because his "coolness has always cancelled it". However, the arrival of new kid Darren Darrenofski changes all of this, and through one playground incident Barry is instantly stripped of his coolness. The book follows his various misguided attempts to regain his coolness (or keelness as Barry and his best friend Bunky prefer to call it) and thus his popularity, presented as a series of vignettes which are guaranteed to make you laugh and cringe in equal measures. What I loved most about this book is that Barry is not a particularly nice child. In fact, he is very much like a large number of pupils I have taught over the years. Kids who act very silly and annoying, and occasionally mean, but become popular because they make other kids laugh (often at the expense of others). And like in this book, sometimes another cooler kid has come along and suddenly the tables are turned. As such I didn't find myself sympathising with Barry's situation, but instead could laugh along at his cringeworthy attempts to be cool again. Stuff like going to school stilts, and wearing a bright yellow knitted woollen nose piece (supposedly in tribute to his favourite TV character, Future Ratboy). As with other books like this Barry Loser is made a much easier read by the number of Jim Smith's illustrations throughout. In fact, there is a drawing on just about every page, and not a great deal of text either, and so even the most reluctant of readers can fly though the 230+ pages relatively quickly. I see how popular the Wimpy Kid books are with our reluctant reader 11 and 12 year olds at school, and therefore even though this is aimed at the 7+ age group I will be ordering a copy for the school library. I feel the level of toilet humour will make it a sure fire hit (oh how they love to read about poos, farts and bogies). 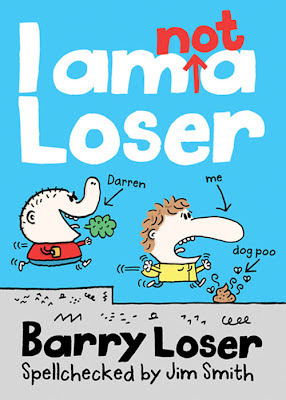 Barry Loser: I Am Not A Loser is published by Egmont today and my thanks go to the publishers for sending me a copy to review. I received a lovely surprise parcel on Saturday, courtesy of the nice people at Scholastic. 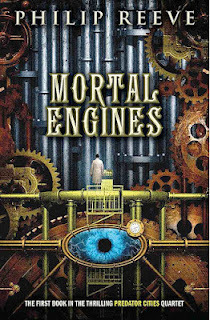 It would appear that Scholastic are relaunching the totally brilliant Mortal Engines series in June, with brand new cover designs and under the series heading of Predator Cities. I have to say, I am something of an old-fashioned purist and prefer the illustrated covers that the first editions of these books came with, but I can see exactly where Scholastic are coming from with these new designs. 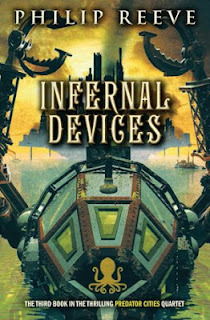 Although steampunk has become a genre in its own right, and is incredibly popular with many adult readers, when I mention the term to the kids at school they tend to give me a blank look. To my great disappointment, they just aren't fussed with beautiful images of brass gears, fantastic steam-driven machines and the Victorian aesthetic. However, when I showed them these new covers on Monday they were in awe, many of them saying how they looked like X-Box games. One boy who would previously have not gone anywhere near a book of this 'thickness' was almost salivating at the thought of reading it. 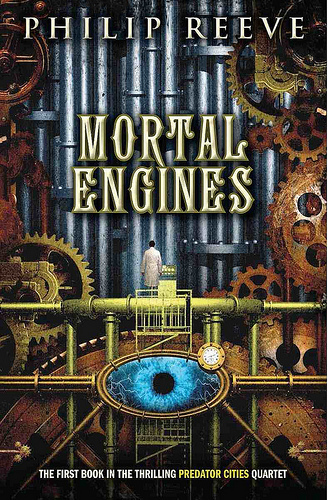 I know that there will be many long time fans of this series that will hate these covers, but most of them will be adults who first discovered Mortal Engines when it was released in 2001, either as young adults or as adult readers. I would like to remind those readers who may not like these new covers that these books were written for the 11+ age group, and given the wonderfully timeless nature of the stories then a redesign of the covers to entice a new generation of readers into diving into them can only be a good thing in my opinion. It would be tragic if stories as perfect as these sat untouched on bookstore shelves just because the covers were out-of-date with current tastes. As for the Predator Cities series title? 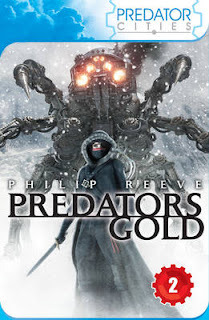 Again, the kids at school loved it, and desperately wanted to know how a city could be a predator. 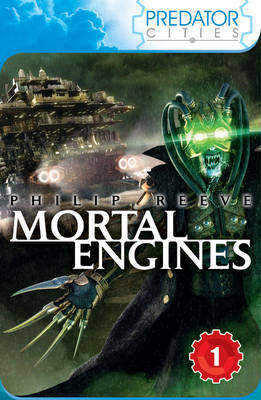 Some of them are going to have to wait a while to find out, as there is now something of a waiting list of pupils who want to read Mortal Engines. The Bonehill Curse is Jon Mayhew's third, and apparently final story set in the dark Victorian world that he introduced to us in Mortlock, and it is yet another fantastic dark fantasy story that has huge appeal for boys and girls alike. It has all the stand out elements that we have come to expect from Jon Mayhew: great characters; brilliant, atmospheric descriptions of a Victorian London where magic lurks in the background; and superb plotting. As with those earlier two books Jon has used his considerable writing talent to put all of these elements together to create this old-school adventure story that has an undercurrent of horror running through it, as well as a soupçon of classic Arabian Nights magic. I can never make up my mind what I like the most about Jon Mayhew's now three books. Much as I love his dark storytelling, I always end up deliberating between whether it his characters or his descriptive writing that stand out the most for me. I guess if I was strapped to a chair and had hot pins shoved under my toenails until I gave an answer I would probably go for his characters, and those is The Bonehill Curse are as good as any he has previously written. Necessity Bonehill is a delight to read - she starts off as an arrogant bully, but as we progress through the adventures that follow her unleashing of the evil djinn we see her have to change in order to survive. However, it is one thing to create a great main character, but Jon Mayhew also manages to breathe colour and life into every member of his supporting cast. Even the djinn, a character whose developemt could quite easily have been overlooked by a lesser writer, is perfectly created and becomes much more than just an ancient evil entity. As with both of his previous books The Bonehill Curse moves along at a cracking pace, and even at 350ish pages long could very easily become a read-in-a-single-sitting book if time permits. For the third time Mayhew sucked me into his dark Victorian world and I really did not want to leave it. There is also a delightful twist that I have to admit took me completely by surprise, and made the story even better for that. If you have not yet read Mortlock or The Demon Collector then this is not a problem as all three can be read as standalone stories. However, Jon very cleverly references the books that came before and it is fun spotting these small crossover tidbits so I strongly recommend you read them in order. Jon has said that this is the last one in the 'trilogy' as he moves on to other unrelated stories, but I for one would love to read more stories set in the world of Mortlock. 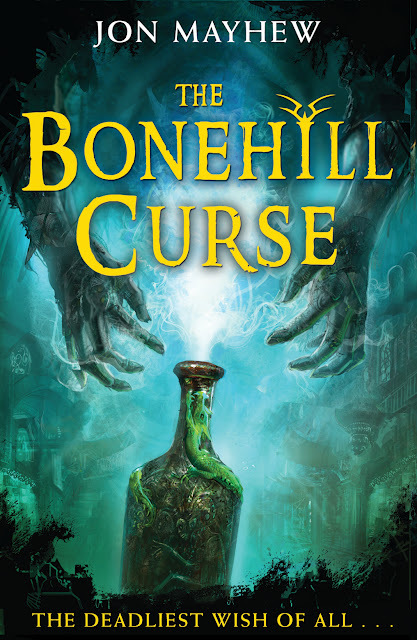 The Bonehill Curse was published by Bloomsbury on 10th May and mt thanks go to the nice people at Bloomsbury for sending me a copy to review. Last Monday I promised to write a few posts about some of the great books out there that are great for kids who seen and loved Avengers Assemble. I managed to get a review of the stunning The Avengers - The Ultimate Guide To Earth's Mightiest Heroes! from Dorling Kindersley, before I was buried in final GCSE and A Level coursework marking, moderating and packing up to send off to the exam board. 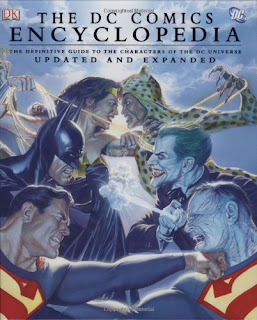 Now that I've finally got room to breathe I wanted to highlight a couple of other gems from Dorling Kindersley that superhero fans will adore: The DC Comics Encyclopedia and The Marvel Encyclopedia. Both books are encyclopedias that I received last year for my birthday, each one focusing on the respective characters from Marvel and DC and both are simply stunning volumes. In both the characters are listed alphabteically, with major characters like Spiderman and Batman being given several double page spreads, whilst the much lesser known characters are given much briefer entries. 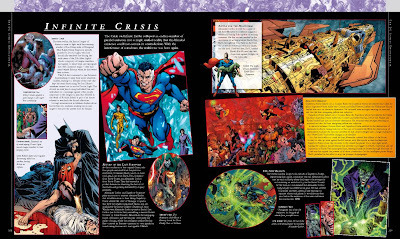 Some of the major 'events' through the history of these comics, such as Infinite Crisis and Civil War are also afforded their own spreads, providing the reader with even more background information. Just as with The Avengers - The Ultimate Guide To Earth's Mightiest Heroes! it is the artwork that immediately grabs your attention with these books, and I couldn't help but rifle through their pages, feasting my eyes on the stunning imagery. After this I was left with a dilemma - to start reading through alphabetically or to jump straight to my favourite characters' entries. I finally decided on starting from the beginning and working though page by page, but this didn't last long and I found myself jumping backwards and forwards, first of all reading about favourites such as Batman and Iron Man, and then jumping to other characters who were referenced in these larger entries. Both of these books were published a few years ago, so naturally, being encyclopedias of comic characters that are still being written about, they are already somewhat out of date. However, this also means that you can currently purchase them for about £10 less than their £30 price tag and they are well worth every penny. Both are updated editions of books that had been first published some years earlier, and given the current massive popularity of DC and Marvel I would not be surprised to see these given another update some time in the future. As I mentioned earlier, I think superhero fans of all ages, boys and girls, will love these books and spend hours and hours poring through them. We have both books in the school library and they are almost as popular as our copies of Ripley's Believe It Or Not and The Guinness Book of Records. 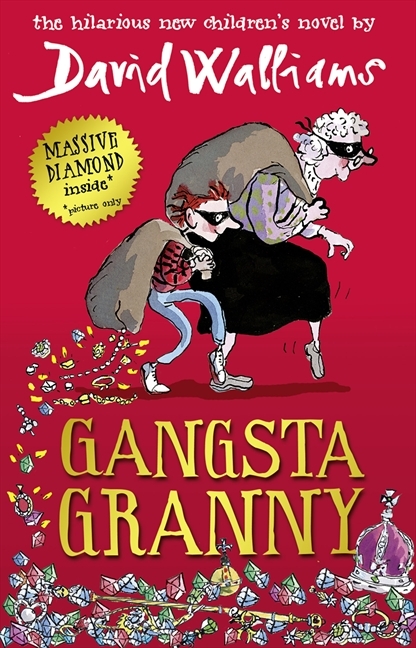 Confession time: Gangsta Granny is the first children's book by David Walliams that I have read. The reason for this is that I am generally wary of books written by celebrities, as they can occasionally be of only average quality, relying on the 'big name' to boost sales. Simon Mayo's Itch was a book that went a long way to dispel this prejudice of mine, and through reading a handful of reviews of his previous books, and spotting his name being linked with the shortlists of various book awards, I started to get the feeling that Mr Walliams's books might have a similar effect. I now need to find the time to read The Boy In The Dress, Billionaire Boy and Mr Stink as I simply loved Gangsta Granny. 'The New Roald Dahl' is a title that reviewers seem keen to bestow on any of a number of current writers of funny children's books, including the likes of Andy Stanton and Ivan Brett. However, much as I love the Mr Gum and Casper Candlewacks books there are several elements about Gangsta Granny that have me now thinking that David Walliams is closer to that title than anyone else at the moment. First up, the humour. I have laughed out loud whilst reading Mr Gumm and Casper Candlewacks, but at times it did feel like their respective authors were almost trying too hard to be funny. That was never the case with Roald Dahl, and it certainly wasn't the case with Walliams's Gangsta Granny. Although I loved Little Britain, I did feel that at times it was a little hit and miss, with it occasionally being far too OTT for my tastes, and I was concerned that this would be the case with Walliams's writing. Instead I was pleasantly surprised to find that the humour in Gangsta Granny is much more restrained, and masterfully woven throughout the story, to create a tale that fills the reader with a warm, happy glow that continues long after the book is finished. This feeling of deep satisfaction is not achieved solely with humour though, and this brings me to the other key element of Gangsta Granny that sets David Walliams above his peers: pathos. Roald Dahl was a master at tapping into the emotions of his readers, and David Walliams is another author who seems to have a firm grasp of how to touch the human heart. The initial relationship between Ben and his grandmother is one that most children (and adults) will be able to associate with. In Ben's mind she is a boring old lady with a passion for Scrabble, and who stinks of cabbage. He hates his weekly Friday night visits when his parents offload him at granny's house so they can go out without him. In fact, it is his parents' attitude towards granny that stinks even more, as they quickly become the villains of the piece. As Ben discovers that his granny might not be as boring as he had initially thought, and the relationship between then grows to a 'you and me vs the world' bond, our heart strings are well and truly plucked at by Walliams. I won't say any more about the plot as it would take away some of the fun I felt when I read it, and I would hate to do that to you. However, I will add that there are some very poignant moments that may bring tears to the eyes of children and adults alike, and it will certainly have you looking at your grandparents in a very different light in future. If his other books are anywhere near as good as Gangsta Granny, and with his epic swims for charity and his recent stealing-the-show appearances on BGT, David Walliams is fast becoming one of our greatest national treasures. His next book (currently untitled) is due out in October - I'm going to be in the front of the queue for this one. My thanks go to the ever wonderful Rosi at HarperCollins for sending me a copy of Gangsta Granny to review. Well done and thank you to all of you who entered. I will now endeavour to contact the winner through by email. Please reply within 48 hours or I will draw another name out of the hat. Many thanks to Headline for providing the prize. Review: The Avengers - The Ultimate Guide To Earth's Mightiest Heroes! 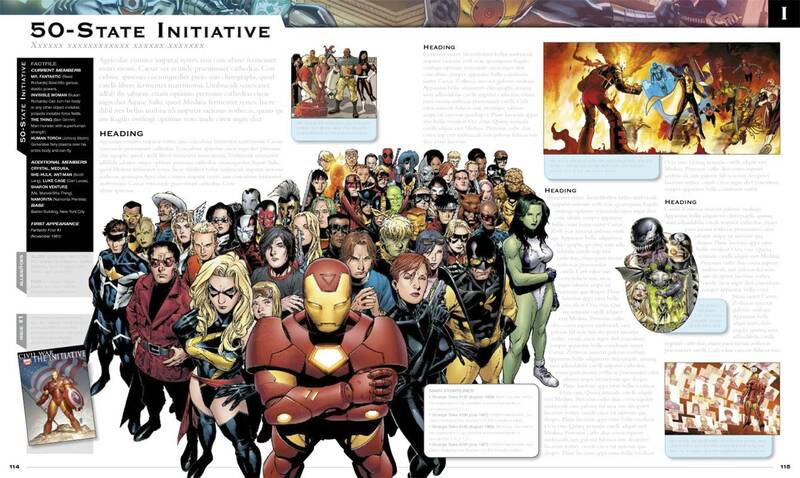 Discover everything about Earth's greatest super hero team in The Avengers: The Ultimate Guide. The story of every single member, from their powers and their allegiences to their enemies is explored in detail and every page is packed with enough comic-book art to satisfy the most avid fans. Ask the average man in the street which companies publish great comic books and they will no doubt answer Marvel and DC. 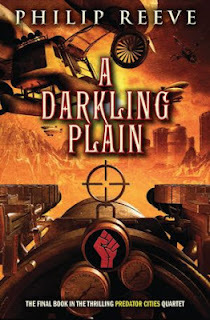 Ask anyone who loves comic books and you will probably get a longer list, and Dorling Kindersley will be in there, and in my opinion should be right near the top. DK publish the most stunning guides to some of Marvel's and DC's most loved creations and over the past couple of years I have slowly been adding these DK books to my collection. I will write another day about some of these books, but wanted to bring this one to your attention first as it is simply stunning, and could be a great way of getting a reluctant reader boy into books. 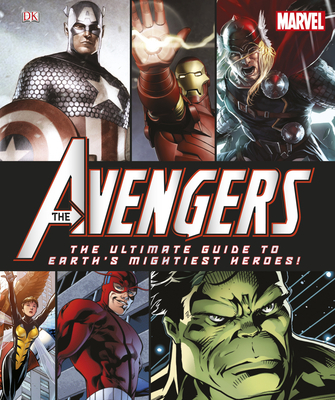 Published to tie in with the recent film release, The Avengers - The Ultimate guide To Earth's Mightiest Heroes! is the perfect book for anyone who has enjoyed the movie. Most young readers may think that The Avengers are made up of only Captain America, Iron Man, Hulk, Thor, Hawkeye and Black Widow, but this book will show them that the history of The Avengers goes back a very long way (September 1963 to be precise), and that over the years more than one hundred characters have come and gone from its ranks. 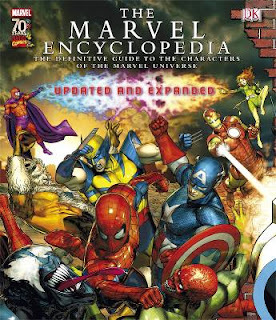 This guide gives details of every single one of them and I think boys will spend many a happy hour poring through this volume, memorising names and images so that they can impress their friends with their new found knowledge of The Avengers. This volume is filled cover to cover with lavishly and lovingly produced pages that tell readers everything they need to know about their favourite superheroes, and introduce many characters that even some die-hard fans may have forgotten about. Big name characters like Iron Man and Captain America (and some of the key villains from the Avengers stories) are given the honour of double page spreads that give key data about the character and their powers, and this is generally accompanied by a lengthier column of text that gives even more background to their history as an Avenger. Readers are also treated to a beautifully rendered full page image of these main characters, as well as smaller images of them as they have appeared in marvel comics through the ages. Lesser know characters are not afforded as much page space, but we are introduced briefly to each and everyone one of them. 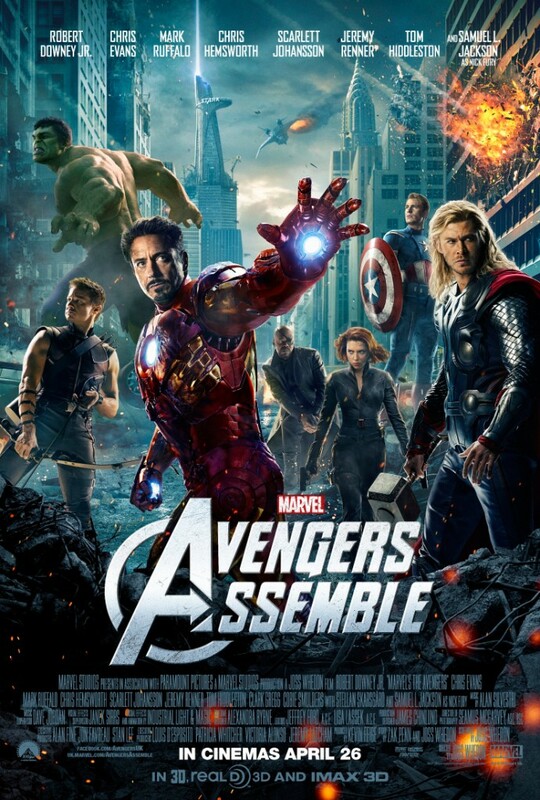 The Avengers - The Ultimate guide To Earth's Mightiest Heroes! is more than just a who's who though. It also includes page after page outlining the major storylines and events, organised decade by decade, and my Amazon wishlist has multiplied in length as I now realise just how many classic stories I need to read. 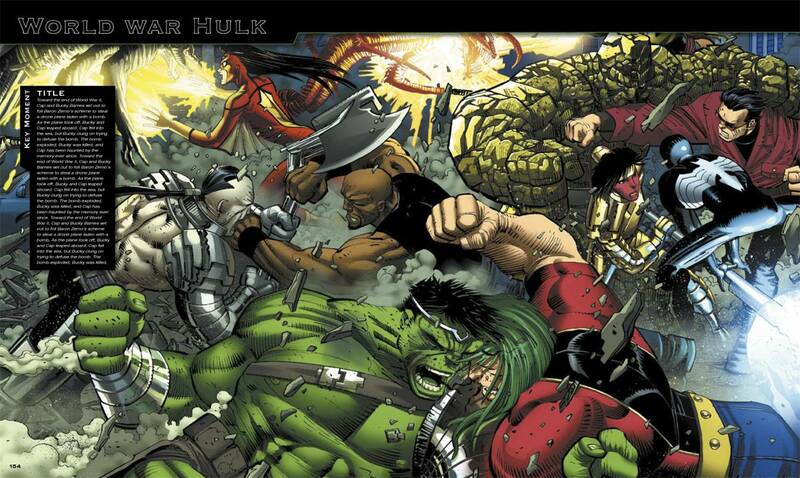 It is very obvious to me that The Avengers - The Ultimate guide To Earth's Mightiest Heroes! is written by people who love comics, and whether you are a long time fan of The Avengers, or a 9+ boy who has only just discovered them through the recent film I think you will love this book as much as I did. They thanks go to the wonderful people at DK for sending me a copy to review. Last year I wrote a blog post about how I had gone to see Batman Live at the O2 Arena, and how I thought that it was a great way to get boys into reading. Now The Avengers movie is here (Avengers Assemble in the UK), and it can be used in a similar way. All the kids at school are talking about this film, boys and girls from Year 7 all the way up to Sixth Form, and I have not yet come across one that didn't love it. Since the film's release we have seen boys who rarely set foot in the library coming in to read the various Marvel books we stock, and even reserving them if they are already out on loan. I have therefore put an order in with the local School Library Service for another pile of Marvel books, hoping to capitalise on the film's success, and I strongly suggest you do similarly, especially if you have a boy who is not keen on reading. Starting tomorrow with a review of a brilliant book from Dorling Kindersley, and then over the next fortnight I intend to post a handful of reviews of books that tie in with the film, directly or indirectly. Books that could ignite that spark in a boy's mind and lead to them wanting to read comics and graphic novels, and hopefully one day novels and non-fiction, so please watch this space. 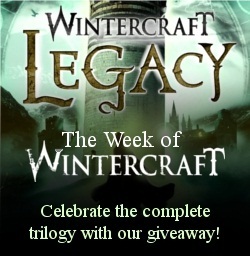 Thursday was publication day for Wintercraft: Legacy the final book in Jenna Burtenshaw's brilliant Wintercraft trilogy. Now, thanks to the generous people at Headline you have the chance to win a set of the three books, simply by filling in your details in the form below. The first name drawn at random after the closing date will win a set of three books. This is a one day competition - the deadline for entries is 10am BST Monday 14th May. This competition is open to UK residents only. Attention Grabber is my sort-of-weekly feature where I post what I think is a great opening paragraph to a book, the sort of opening that pulls young readers in and hooks them from the start. As I posted my review of Brothers To The Death by Darren Shan on Monday, this week I thought my attention grabber should be from the books that started it all, Cirque Du Freak. By this I mean much more than it being the start of the hugely popular The Saga of Darren Shan - it is the book that in my opinion opened the door for the majority of the brilliant children's and YA horror books that have been released since. With so many great horror books available these days it is hard to believe that before Darren Shan's vampire saga there was little blood splatter or gore in books for young readers. "I've always been fascinated by spiders. I used to collect them when I was younger. I'd spend hours rooting through the dusty old shed at the bottom of our garden, hunting the cobwebs for lurking eight-legged predators. When I found one, I'd bring it in and let it loose in my bedroom. It used to drive my mum mad! Usually, the spider would slip away after no more than a day or two, never to be seen again, but sometimes they hung around longer. I had one who made a cobweb above my bed and stood sentry for almost a month. Going to sleep, I used to imagine the spider creeping down, crawling into my mouth, sliding down my throat and laying loads of eggs in my belly. The baby spiders would hatch after a while and eat me alive, from the inside out." I have just seen a tweet by Darren Shan to announce that today marks the 15th anniversary of when he first had the idea for Cirque Du Freak, a book which in my opinion paved the way for just about every writer of children's and YA horror ever since. 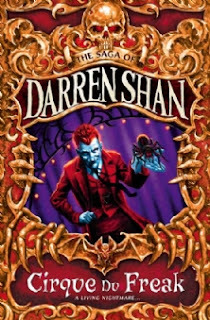 I feel it is only fitting that I should honour this occasion by posting my review of Brothers To The Death, the final instalment in his Saga of Larten Crepsley, a character we first met in Cirque. Brothers To The Death is Shan at his very best as a writer, and I challenge any fan of his vampire books not to find this a rewarding and deeply satisfying read. I have a feeling that, come the final words of this book there will be a legion of fans who, like I did, feel a broad grin erupt on their face, at which point they will probably, again like me, reach for their well-read copy of Cirque Du Freak and continue the story. I don't think I am spoiling anything when I say that, due to the way Brothers To The Death ends with everything slotting together perfectly, Cirque Du Freak will from this point on forever feel like the perfect sequel in a way that would have George Lucas going green with envy. One of the things I like the most about Shan's vampires is that, with a minority of exceptions, they are not evil creatures. They are just different from humans, and by and large prefer not to interfere in the politics and actions of mortal man. This allows for much better character development of the vampires than we usually see in such novels, where the main protagonist is quite often a human, and Darren Shan is not afraid to turn our perception of these supposedly hateful characters on its head. As such, over this series we have seen Larten aid troops during the Great War, and even fall in love with a mortal (without wanting to drain her blood). 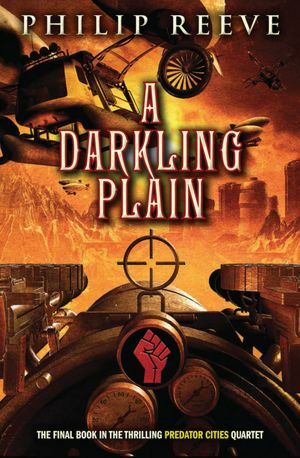 In this instalment, much of it set during the horrors of WWII, we see even more humanitarian actions from Larten and some of his compatriots, as they help to heal victims of the war, both in Germany and post-atom bomb Japan. We also see Larten make friends with a community of monks. Unlike the majority of religious people in vampire fiction, these holy men do not look on the vampires as evil incarnate, but as just another of God's creations. As I mentioned, some of this book is set in Europe during the 1930s and 1940s, and as such the Nazis play an important role in the plot. As a result of loose talk, Adolf Hitler has discovered the existence of the vampires, and sends emissaries to meet with members of the clan with a view to forging an alliance. Larten finds himself accompanying one of the vampire princes to one such series of meetings, and finds himself put on the spot and asked for his opinion. The answer he gives will go on to affect his life in a way he could not have dreamed, and leads to an event that sees him spend much of the rest of the book thirsting for revenge, travelling the world in search of the perpetrator. Fans of the the original books and now The Saga of Larten Crepsley have been asking numerous questions as this prequel series has progressed, and they will be very happy that those questions are all answered in this volume. There has been some speculation in the comments sections of some of my reviews of the books as to the fate of Wester, as he is not mentioned in original series. To those who took the time to comment on this I say you will not be disappointed! Other queries related to Larten's relationship with some of his fellow vampires that we know from the original series are also fleshed out, as is his connection with the Mr Tall and his Cirque, and also how Madam Octa came into his possession. 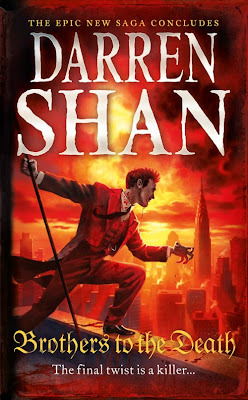 Much as I loved the original Saga of Darren Shan, and also his Demonata books, I think the four books that now comprise The Saga of Larten Crepsley are now my favourite Darren Shan books. His writing has matured considerably since Cirque Du Freak, especially in the way he develops his main characters. Larten is the ultimate anti-hero, deeply flawed and carrying some rather despicable baggage from his long life, but Shan manages to create an emotional bond in his readers that have them pitying him rather than condemning him. Many young readers will find themselves able to relate to this lonely wanderer, who goes through lengthy periods of low self-esteem, and I think many will be deeply moved by the events that happen in this book. This books marks the end of an era for Darren Shan, as it is his goodbye to vampires and Harper Collins. In September we will see the release of his new twelve-books series, Zom-B, with Simon and Schuster, and after this brilliant end to The Saga of Larten Crepsley I am looking forward to that more than ever. However, I feel one must never say never where Darren Shan is concerned - it would not surprise me if he decided to return to writing about his vampire world again some time in the future. With so many books to read, and consequently so many reviews to write, I decided to give my Attention Grabber feature a break for a while. For those of you who are new to The Book zone, Attention Grabber was my weekly feature where I post what I think is a great opening paragraph to a book, the sort of opening that pulls young readers in and hooks them from the start. 'There used to be more of us. I'm certain of this. Not enough to fill a sports stadium or even a movie theatre, but certainly more than what's left today. Truth is, I don't think there's any of us left. Except me. It's what happens when you're a delicacy. When you're craved. You go extinct. 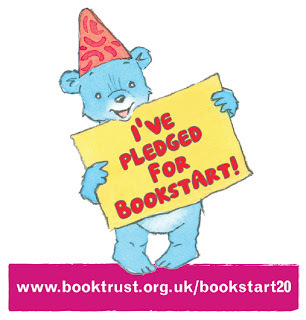 I received an email today from the lovely people at Booktrust, asking if I would help promote their Bookstart 20 celebration with a short blog post. How could I say now? The Booktrust do fantastic work promoting reading for enjoyment not just for children, but for people of all ages, and I have seen first hand the impact their Booked Up! scheme has had on some of the children at school. 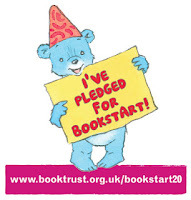 Sadly due to funding cuts Booked Up is no longer, but Bookstart, the scheme whereby free books are given to babies, toddler and 3-year olds, is alive and kicking, and we want to keep it that way. - reading picture books with your own children or other members of your family at bedtime or at anytime! - posting a book review on a website. Naturally I have now made my pledge to Bookstart 20, and I hope that you will head on over to the Bookstart 20 website here and do the same. Obviously, making a pledge like this is quite easy for a blogger, and someone who occasionally reads to pupils in lessons, but I will dedicate twenty of my reviews this year to the Bookstart 20 programme, so watch out for the Bookstart 20 pledge button. 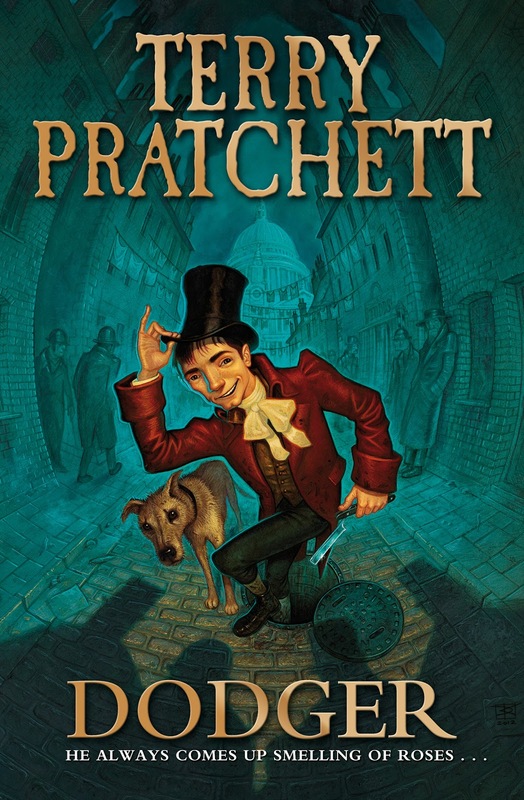 A while back it was announced that in September Doubleday will be publishing a new book by Terry Pratchett called Dodger. This is not a Discworld novel, it is a book for 11+ readers inspired by the Artful Dodger, one of Charles Dickens' most popular characters. I can't tell you much more about it at the moment, as the manuscript is being kept under lock and key whilst it goes through final edits, etc. but I can show you the cover, and also the blurb that is currently shown on Amazon. Terry Pratchett does mystery and adventure in Victorian London? I want to be at the front of the queue for this one! In an alternative London, ruled by the young Queen Victoria, an enterprising lad can find adventure and opportunity — if he is very smart, and very, very lucky. Dodger has the brains, the luck — and the cheek — to scrape by on his own. Everyone knows Dodger, and everyone likes Dodger. Which is a good thing, because life for a boy on the streets is anything but easy. And it’s about to get seriously complicated as a simple haircut turns momentous when Dodger unknowingly puts a stop to the murderous barber Sweeney Todd. 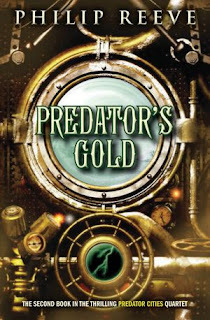 From Dodger’s encounters with fictional villains to his meetings with Darwin, Disraeli, and Dickens, history and fantasy intertwine in a breathtaking tale of adventure and mystery, unexpected coming-of-age, and one remarkable boy’s rise in a complex and fascinating world. Some time ago I received the monthly blogger's email from the nice people at Simon and Schuster and The Hunt jumped out at me because of the above blurb. Normally I wouldn't get so excited about a vampire book (Department 19 being the obvious exception) as I feel that YA writers have sucked (pun intended) all of the gruesome fun out of the genre, turning what should be vicious, bloodthirsty monsters into insipid, pretty-boys, who are only one step away from being in a Mills & Boon novel. However, from its blurb The Hunt struck me as being similar in theme to Richard Matheson's I Am Legend, or the film Daybreakers, and I crossed my fingers in the hope that there would be blood, and lots of it. When the booked arrived I couldn't help but feel dismay. Just look at the cover. That overly attractive male model screams pretty-boy, and so the book sat on my shelf for some time as other, more boy-friendly-looking books were promoted over it. However, last week I finally decided I was in the mood to give it a try, and even now, writing this review, I am still struggling to contain the maniacal laughter that has wanted to burst from deep within me ever since. What's was so funny? I hear you ask. Simple - the thought of all those girly teenage Twilight fans picking this book up, thinking they are going to be treated to a vampire-themed romance and instead being subjected to a brutal gore-fest that will have them waking screaming in the night. (OK, the responsible teacher part of me will also make sure my school librarian knows to mention this to any young girls who decide to give The Hunt a try). After a great, attention grabbing opening chapter, the first part of the book moves at a fairly slow pace. At first I wasn't sure about this, but the further I got through this part of the book, the more I felt the discomfort grow and grow. The story is told in the first person by Gene (although we don't know his name for quite a lot of the book), a teen boy who is possibly the last remaining human in a world where vampires have taken over (although they are never referred to as vampires - in this world they are the norm, they are just people). This first handful of chapters introduce us to the difficult life that Gene has to lead just to survive. Before being bitten and running off into the night to destroy himself, Gene's father drilled into him a set of survival rules which Gene must follow to the letter if he is to avoid being torn apart by his peers. You see Gene does not hide out in a remote mountain hut, he lives in a suburban house, and attends school daily nightly. Every night he sits in lessons with other teenagers who would literally tear him apart if they realised he was human (or heper). He avoids detection by going through his daily pre-school ritual, which includes polishing his fake fangs, shaving hair from his face, legs, arms, etc, masking his body odour and so on. What Andrew Fukuda did in these opening chapters was instil in me a sense of very uncomfortable dread - surely there was no way that Gene was going to survive indefinitely? Surely it would only be a matter of time before the blood splatter hit the fan? As such I was on tenterhooks, page after page, fearing the worst. It was fortunate that the story gripped me like this as otherwise I may have given up on it early on, as a little voice in the back of my head kept on whispering that it might be just a Hunger Games rip-off. The premise is similar - every ten years a group of people (aka vampires) are selected at random to take part in the Heper Hunt, an event designed purely to keep the Ruler in good favour with his people. The winner is the person who can kill the most hepers. However, my fears were soon allayed (forget Hunger Games - thankfully it is much closer in theme to I Am Legend) when Gene was taken to the Heper Institute and the process of initiation began. The period of initiation takes up the majority of the rest of the book, with Gene surrounded by heper-hungry vamps, but without his survival kit of razor, deodorising paste, or even that most essential of items for humans - water. Thus he spends almost every minute of every night fearing that at any moment one of his fellow hunters may see through his act. As I said before, these vampires are violent. Actually, violent doesn't even come close - unlike many vampires they have an animalistic urge to tear hepers apart, and their bodies react to even the slightest whiff of heper. Cue lots of drool, flying saliva, gnashing teeth, and so on. I don't want to say much more about the story as I could very easily give away some of the key plot twists. Suffice to say I think Andrew Fukuda has managed to breathe life into the slightly worn out vampire mythos, with his tight plotting and skill at building suspense for his reader. I have to say though that I was disappointed that we aren't told more about this dystopian society, and especially how it came into being. Quite often I found myself with a question about the world or its inhabitants that I hoped would be answered, only to be disappointed. There were also several other elements slipped in here and there that had me wondering where the author was going, again only to find that the reveal was not to be. The book does end on something of a cliffhanger, so I am hoping that my questions will all be answered in the sequel, a book I am already impatient to read.